Scrollout F1 is my major defence against all incoming spam waves. Using it for quite some time now, easily hosted at Hetzner, I have tweaked around some of the settings. Here I will document the change I needed to make to send email from my Mac OS infrastructure outgoing through the Scrollout F1 appliance. This is the mail system at host my.mailserver. Means I found the defaults! Different ones for different protection levels .. 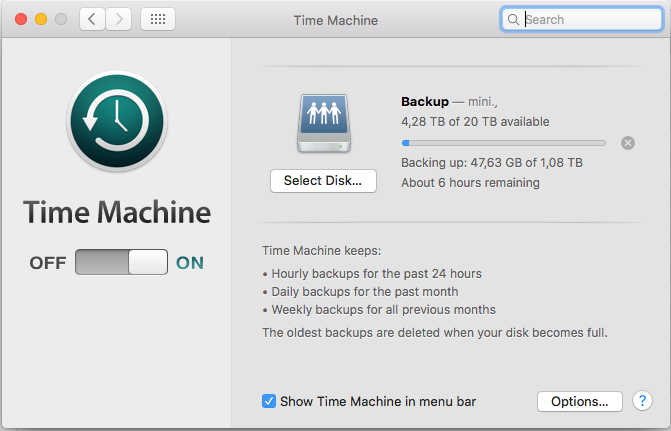 Since I moved my Promise Pegasus storage to the new Mac (which still runs High Sierra), I had to find a way to use Time Machine from my old MacMini. The old one still runs El Capitan. I read about the new File Sharing feature and created a folder which was shared and had under „Advanced Options“ the „Share as a Time Machine backup destination“ turned on. Still, I couldn’t select this target folder on my old MacMini. Thus I went to „Options“ and enabled both SMB and AFP to allow my old MacMini with MacOS El Capitan to use the TimeMachine feature from MacOS HighSierra (or Mojave in the near future). After enabling AFP, I was able to connect to the shared folder and afterwards select the folder from the newer MacOS to backup my older MacOS based MacMini. Today I set up my system with Mac OS High Sierra and again encountered issues while using my Kyocera printer to scan to a folder on my Mac. 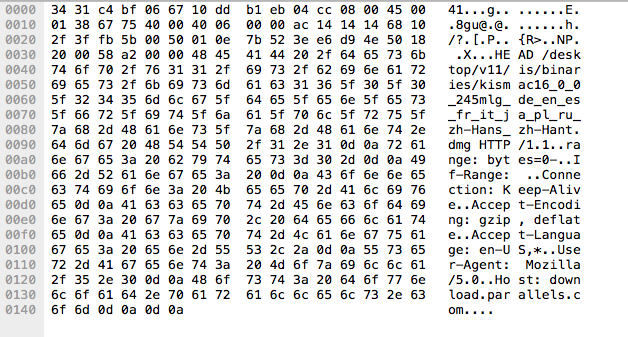 The initial steps were to enable file sharing via SMB (without encryption!) and then set up the Kyocera as discussed in several blogs. Firstly enable ACL permissions for SMB shares with the following command. Then set up inheritance permissions on the parent holder with the following command. This should recursively go through your share and apply the relevant permissions. This worked perfectly for me! Now I am happy to use the scanning to folder function safely on my Kyocera. I had shared this family calendar and forgotten about it … until I used it again to enter several appointments. Unfortunately, one family member thought that was a mistake and they had to be deleted. Which let me scratch my head, how I could restore those calendar entries either on Mac OS or in iOS. And yes! This worked flawlessly. I was able to fetch a backup from just after midnight (12:35 AM, at first got afraid that no backup was available, until I checked that 12:35 AM is right after midnight, here in Germany we would say 0:35 hrs … ) and restore the calendar content. That worked and I had all my appointments back. Easy, wasn’t it? So I am still running Mac OS El Capitan Server Edition on my Mac Mini. Recently, the Spam that comes through, has increased again and I wondered if there is any mechanism to implement AntiSpam in Mac OS X.
which is not exactly what I wanted. spamtrainer assists Mac OS X Server mail services administrators in updating and maintaining their SpamAssassin bayes database. spamtrainer will read the designated HAM and SPAM mailboxes, update the SpamAssassin databases and delete mail that has been learned from. Either there is no mailbox called No GUID found for user: junkmail in the mailpartition or it has never been fed with mail. Either there is no mailbox called No GUID found for user: notjunkmail in the mailpartition or it has never been fed with mail. So I go an create those users. 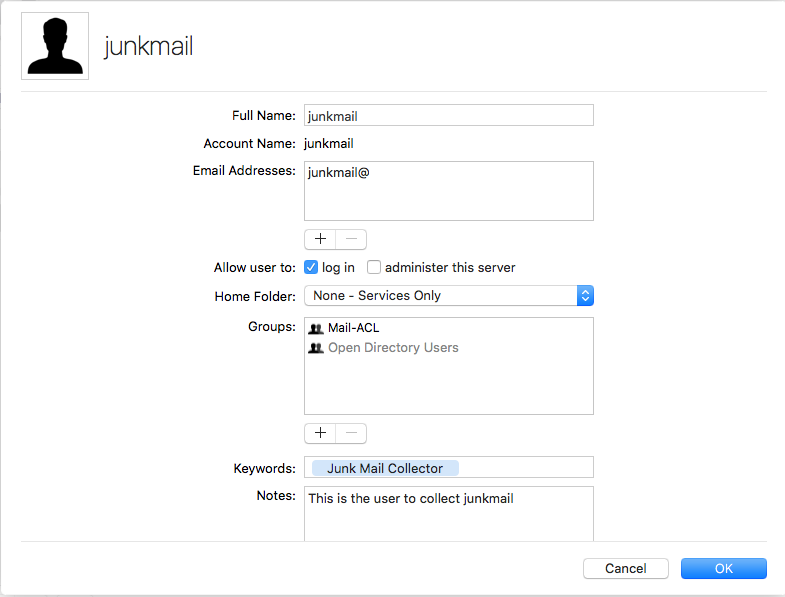 Starting the Server.app plus adding the needed network accounts „junkmail“ and „notjunkmail“. Further I edit access so that these accounts only have access to the Mail service. Now I add these accounts to Mail so that I have access to them. it does what it should. Using the install option I can also have it run as plist item. What time would you like spamtrainer to run (24-hour format)? That is all for installation, now let me see if it does what it should! Ok, if you would like to go from there – no problem. But if you would like to install this license on another Mac it gets a bit difficult to acquire the installation kit. 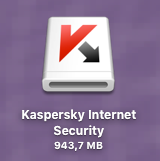 I thought I would download it from the regular Kaspersky website, but unfortunately – the Parallels license key doesn’t work with the regular download package. 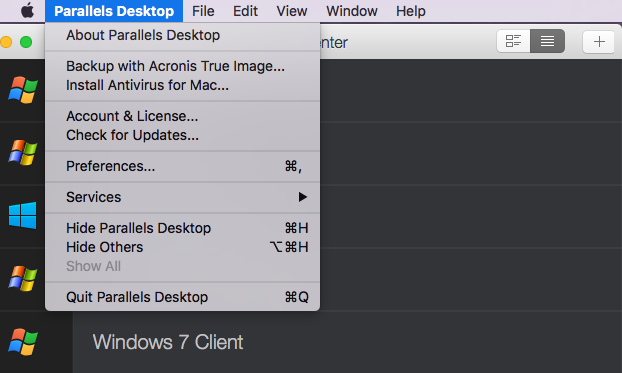 The parallels code can only be used with a Parallels versions of Kaspersky, it cannot be registered with a trial version. The Parallels version of Kaspersky can only be downloaded from Parallels‘ servers. There is no external download source. This is also reflected in the Parallels KB article (123871). I love my two Promise Pegasus R4 Thunderbolt Storage Shelters. Some months ago I upgraded the Backup Storage to 3TB drives, Seagate’s ST3000DM001. Unfortunately, as Backblaze reveals, this series is very buggy and not at all recommendable. So, whenever one of the drives had failed, I would substitute it with a Seagate ST4000DM000 drive, which is a 4TB model. Backblaze shows, that this model is quite ok when it comes to error statistics. What I always thought was, that Promise Pegasus R series would only support the drive models which can be found in the Pegasus Promise compatibility listing. But No! What drives can be used with Promise Pegasus R4, R6 or R8? The Seagate NAS drive ST4000VN000-1H41, which is a typical SATA drive with 4TB capacity, runs well in the Promise Pegasus R series, even though it is not listed in the compatibility list. And I am still running on firmware release 5.04.0000.36. The benefit of this slightly more expensive hard disk is a 3 year warranty (within Germany) and – as Seagate claims – some extra routines to make it work 7×24. So I looked into System Preferences and Users again and thought, I might create a local user called „scanuser“. This I did, and suddenly my Kyocera printer & scanner was willing to talk to the SMB share on my Mac OS Server again. Finally: Jahrelang lief auf meinem Root-Server bei IBH halb versteckt der Blog Äppeltexte auf einer Installation von Movable Type. Da es MT ja nicht mehr als OpenSource gibt, ist eine WordPress-Installation das naheliegendste. Daher heute Abend mal fix die Installation angeworfen, die wirklich supereinfach auf einem Debian GNU/Jessie durchzuführen ist. Dann half Google weiter, um etwas über die Migration von Movable Type zu WordPress nachzulesen. Ich empfehle den Beitrag Importing from Movable Type to WordPress. Jetzt freue ich mich, hier auf WordPress-Basis weiterbloggen zu können! Da ich nun doch eine Weile gesucht habe, ehe ich auf den Artikel bei Apple gestoßen bin (und dann noch eine Weile überlegt habe, welche Buttons ich tatsächlich anklicken muss), gebe ich die Erfahrungen hier mal weiter. Das eigentliche Ziel war die Änderung des „Kurznamens“ oder shortnames oder auch accountname eines User-Accounts auf dem MacBook Pro, die zugehörige Vorgehensweise ist auch in einem Apple Artikel beschrieben. 7. Jetzt im Menü von Mac OS (Bildschirmrand oben) auf „Bearbeiten“ klicken und dann im Dropdown Menü „root-Benutzer aktivieren“. Für das deaktivieren geht man den gleichen Weg, nur wählt man im letzten Schritt „root-Benutzer deaktivieren“.